Technology is always changing and advancing the way we live our lives, unless you are a luddite and live in an Amish community that is! Some people oppose technological change, and I respect them for that, but personally I embrace it – techie all the way! Technology is likely to improve the way we do business significantly in the near future, but how? In this article I am going to write about some of the latest and greatest technology which is going to revolutionise the way we work! Okay, so you may be thinking that we already have keyboards that are pretty portable, you can get role up ones that you can take almost anywhere. The problem with these is of course, they do take up space, and often they cannot connect to your smartphone or tablet. The future solution to this problem is already here: The Magic Cube. 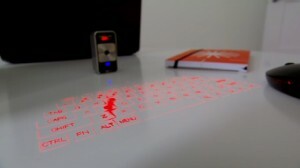 The Magic Cube is a super portable wireless laser keyboard, which has been developed by a company called Celluon. It is basically a little box which can project a laser keyboard onto any flat surfaces, and then works out what you are typing by where your fingers break the lasers. This is no ordinary keyboard though, it can connect via Bluetooth to most smartphones, laptops, tablets and desktops, so wherever you are, no matter what your device, if you have your Magic Cube, you have a keyboard! In the very near future, we will be able to control screens using our hands, and not by touching the screen (that technology already exists) but by simply waving a hand in the air. The 2002 film Minority Report featured futuristic hand motion technology where detectives could push images off to the side and bring up more content just by waving their hands in the air. This was in the movie, because the film makers heard that the technology was being developed. In the future we are likely to see much better integration of all technologies. Mainly thanks to the likes of cloud computing and improvements in wireless technology, it should become easier and easier to transfer files from device to to device. Smartphones and tablets have and are still revolutionising the way we do business. Smartphones and tablets have significantly improved the way we do business and communicate, but it is the apps that you can download onto them that are likely to significantly change the way we do business in the future. We already have apps that can scan and store your business cards, store details on your asset and save your important documents, but in the future you can expect many more effective, impressive apps. Some examples of apps which we may see developed in the future (or that are being developed now) are the likes of more powerful, real time translators, high performance graphic design apps, apps which make paying, transferring and receiving money much easier, human quality text to speech apps, and many more. 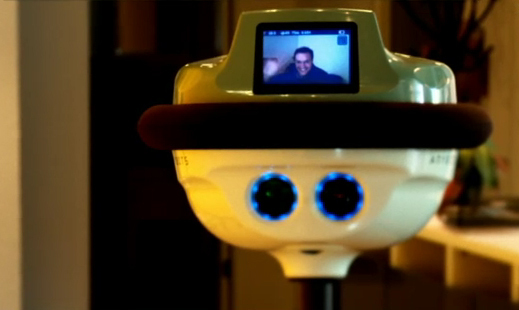 A US based company called Anybots have created a very cool little robot called QB, which uses the latest in wireless technology to create a portable webcam, so when conference calling, you almost feel as though you are in the room (thanks to your movable position) with your colleagues. The robots have freedom of movement, so they can go anywhere in the office. On the head section of the QB, there is a webcam, so that you can see what the robot sees, and a screen, so you can be seen by those in the office. QB means that you can be anywhere in the world, and yet still check up on those in the office, meaning that working out of the office is so much easier than ever before! QB could also help to significantly reduce the costs to businesses of travel, as fewer employees will need to be on the move. 3D printing is a new technology, which some critics say will be as big a revolution as the internet! 3D printing will allow firms to print products to order in store, bringing huge savings to firms in terms of transportation. Some predict that by the end of the decade, 3D printers will be a common household object, where we can print things, in 3D out of a whole range of different materials. I plan to write an article in the near future about 3D printing, so stay tuned! UPDATE: I have now written that article, and it can be found here: 3D printing – a revolution on the horizon? So, the future looks very exciting, but what do you think of it? Have you heard anything that I haven’t? Really, it’s not just apps that will be important in the future, but the entire mobile platform. Smartphones and tablets will become the standard in the future replacing laptops and desktops, I think. I would agree that they are going to become bigger, but I still think that the desktop will have a place. I actually considered writing something about holograms in there Jonny, but didn’t really think I had enough knowledge to do so. That research you have given me is very interesting, although sadly I have only time to read a small part of it, as my day doesn’t give me the time to read all 110 pages! Being a technology buff, I really enjoyed this article. Every time I read about these new technologies it really interests me. Ever since I first saw the TED Talk on the Sixth Sense 2 years ago I knew technology was on its way to reach unmatched heights. Another fascinating development is that of 3D Printing. I am probably one of those who thinks it might be as big as the Internet as there are massive potentials for this one. Its proposed that 3D printers could also help in industrial operation like building buildings, etc. Can’t wait for you next article on 3D Printing, Christopher. I beleave that the days where every one has a place of his own in the office will be gone soon. Internet and mobile technology are getting better and faster. Flex working and working from home will be the new standard in a few years. The way things are going John, I wouldn’t be surprised if you are right. What will happen to all the offices once everyone works from home? An interesting thought! we’ll be browsing the internet with a small device called a smart phone?